Speedify is here to help you avoid using too much mobile data--and to avoid hefty overage fees from your carrier. 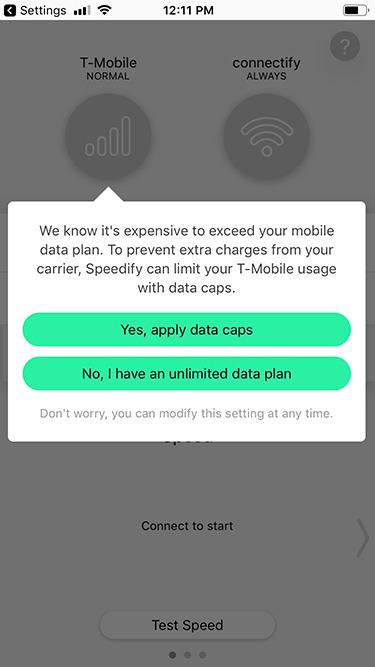 If you opt to set these limits, Speedify defaults to a data cap of 2GB per month and 200MB per day on your Cellular connection. The Cellular is also set to Normal priority. This means that it is used less than the Wi-Fi connection. Speedify will use the Wi-Fi as long as it fast enough for what you are doing. If it can't keep up, then Speedify will also use some of the Cellular connection for a speed boost. If the Wi-Fi fails entirely, Cellular will be used as a failover. You can edit these settings at any time by tapping the Connection Bubble for the connection you're interested in managing. Below are some recommendations. Set a realistic Data Limit: Set a data limit that is lower than your actual monthly cap. You should also set a daily data limit. We recommend starting with a daily limit that's about 10% of your monthly limit. If you set 2GB per month, then set your daily limit to 200MB. We suggest 10% to allow for variation between days: sometimes you'll need more data, sometimes less. Note that Speedify only measures data usage while you are connected to a Speed Server. Unless you use Speedify 100% of the time, you should set your Monthly Limit to less than your actual carrier data cap. Set your Priority: By default, cellular connections are set to Normal. This means they won't be used when you have a good Wi-Fi connection. You can also set your cellular connection to Backup, in which case it's used only when the Wi-Fi isn't working at all. If you have only a cellular connection, Speedify will use that connection.